Kimberley is the capital city of South Africa’s Northern Cape Province. It’s known for its 19th-century diamond mines, like the deep, hand-dug Big Hole. Nearby, the Kimberley Mine Museum is a re-creation of the town in its heyday, and displays jewelry and uncut diamonds. The William Humphreys Art Gallery exhibits South African work, Old Master drawings, 17th-century European paintings and modern art. 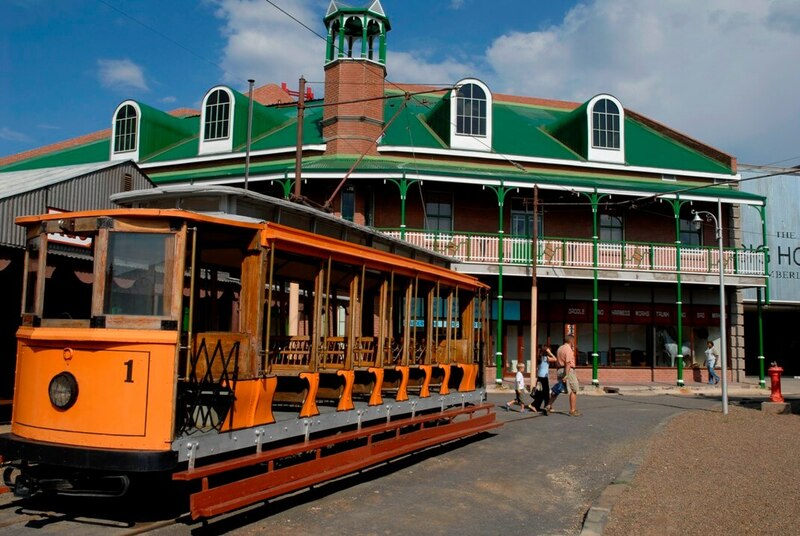 Kimberley is the only South African city with an operational tram system, dating back to the time of the diamond rush. Surrounding Kimberley are many memorials and sites of some important battles of the Anglo-Boer war, most notably the Siege of Kimberley in 1899 with the famous “Long Cecil” on display, and the battlefield site of Magersfontein where Boer General used trench warfare for the first time. The city boasts other firsts like the first city in the Southern Hemisphere to install electric street lighting and the first city in South Africa to switch to an automatic exchanges, and it housed the country’s first Stock Exchange. As miners arrived in their thousands the hill disappeared and subsequently became known as the Big Hole (or Kimberley se Gat in Afrikaans) or, more formally, Kimberley Mine. From mid-July 1871 to 1914, 50,000 miners dug the hole with picks and shovels, yielding 2,722 kg of diamonds. The Big Hole has a surface of 17 hectares (42 acres) and is 463 metres wide. It was excavated to a depth of 240 m, but then partially infilled with debris reducing its depth to about 215 m; since then it has accumulated water to a depth of 40 m leaving 175 m visible. Beneath the surface, the Kimberley Mine underneath the Big Hole was mined to a depth of 1097 metres. A popular local myth claims that it is the largest hand-dug hole on the world, however Jagersfontein Mine appears to hold that record. The Big Hole is the principal feature of a May 2004 submission which placed “Kimberley Mines and associated early industries” on UNESCO’s World Heritage Tentative Lists. What makes Kimberley’s Big Hole that much more interesting is that it is an entirely man-made structure; the largest hand-dug excavation in the world. By 1873 Kimberley was the second largest town in South Africa, having an approximate population of 40,000. Kimberley is set in a relatively flat landscape with no prominent topographic features within the urban limits. The only “hills” are debris dumps generated by more than a century of diamond mining. From the 1990s these were being recycled and poured back into De Beers Mine (by 2010 it was filled to within a few tens of metres of the surface). Certain of the mine dumps, in the vicinity of the Big Hole, have been proclaimed as heritage features and are to be preserved as part of the historic industrial landscape of Kimberley. The surrounding rural landscape, not more than a few minutes’ drive from any part of the city, consists of relatively flat plains dotted with hills, mainly outcropping basement rock (andesite) to the north and north west, or Karoo age dolerite to the south and east. Shallow pans formed in the plains. One of Kimberley’s famous features is Kamfers Dam, a large pan north of the city, which is an important wetland supporting a breeding colony of lesser flamingos. Conservation initiatives in the area aim to bring people from the city in touch with its wildlife. In 2012 rising water levels flooded the artificial island built to enhance flamingo breeding, while in December 2013 a local outbreak of avian botulism bacteria resulted in the deaths of hundreds of birds. The island has since re-emerged. Kimberly is in the Northern Cape of South Africa and this region is malaria free. Barkly West is 35 Km’s to the north west on the R31. The Sol Plaatje Local Municipality is a Category B municipality located in the Frances Baard District in the Northern Cape Province. It is bordered by Dikgatlong in the north, the Pixley ka Seme District in the south and west, and the Free State Province in the east. It is one of the four municipalities that make up the district, accounting for a quarter of its geographical area. It includes the diamond mining city of Kimberley. Although predominantly a mining and agricultural region, Frances Baard District Municipality also offers rich experiences in terms of culture and history. The climate is favourable for outdoor living with a great number of sunny days throughout the year. Two of the largest rivers, the Orange and Vaal, flow through the district. The Duggan Cronin Gallery, which holds a collection of early photographs of indigenous Africans. In the highstakes world of the diamond rush, as many as 30 000 diggers would scour the soil for their fortunes, with some striking it rich and others finding only misery. Many of those who got lucky made enormous sums of money from the diamond trade and by the turn of the century, Kimberley had become the undisputed diamond capital of the world. Yet this was a town founded on greed and it resembled, in many ways, something out of the Wild West, with gambling, prostitution, mobsters and disease rife. Despite this, the city retained it’s architectural elegance and Kimberley’s oldest residential suburb, Belgravia, dates back to the 1870s, bearing testament to the success stories of the time, with many of these massive homes built during the peak of diamond trade. It’s said that there was once more millionaires in this area than anywhere else in the world. The Big Hole located right in the middle of town is a huge crater dug almost entirely with picks and shovels in an effort to reach the stones. 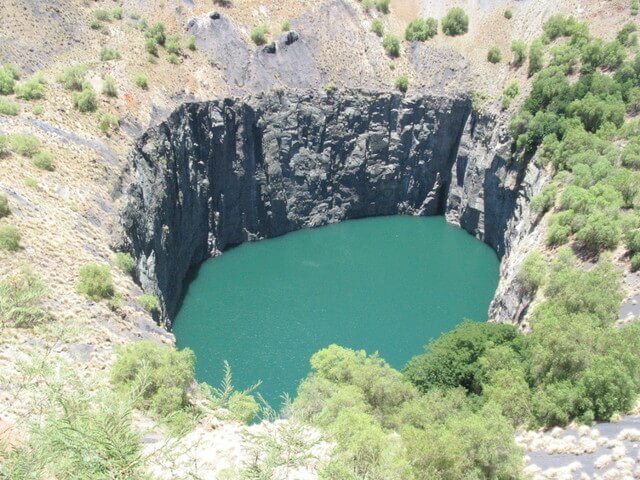 The pit measures over a kilometre deep, with a surface area of 17 hectares, and here men, with little more than man-made tools, managed to remove three tons of diamonds and 22.5 million tons of earth in the process. Today it has been converted into an open air museum with a rather daring lookout point directly over the hole.​Adjacent to the Big Hole is the Kimberley Mine Museum, which displays just how the city was during the frenetic days of the diamond rush. A guided underground tour (some 840 metres beneath the earth’s surface) of the De Beers diamond mine is fascinating, there is certainly plenty more to Kimberley than rem- nants of the diamond rush and workings of an old diamond mine. The historical city centre is full of monuments, museums and art galleries, many of which can be found inside some of the stunning old Victorian homes, while the Town Hall is a stunning example of late 18th century architecture. Naturally, there are many jewellers to be found in this city, with great deals on precious metals and gemstones to be discovered. There’s also the Kimberley ghost trail that reveals all the haunted corners of the city. Art lovers are also in for a treat as there are numerous galleries that showcase art from the San rock art through to 16th and 17th century Flemish, Dutch, English and French masters and contemporary artists. For the historians, Kimberley offers up much in the way of battlefields tours, including Battle of Magersfontein site, just 30 kilometres from the city. There is an observation point from which there are good views of the battlefield and the trenches. There is a small museum with a collection of weapons and uniforms. During the diamond rush, Kimberley was a fast growing, exciting town to be a part of shops, pubs, houses, gambling spots and dance halls sprang up at pace around the Big Hole and Kimberley became a magnet for all types of people, from adventurers to hustlers, chancers and ladies of the night. The tram system, set up by the Victoria Tramways Company, first started transporting people to the ever-expanding Big Hole in 1887 and today you can take a 20-minute ride on the vintage orange tram around the Big Hole, starting at the Kimberley Mine Museum. The tram heads from the museum past historical features such as the original mining shaft and the authentic West End bar, round the Big Hole to the viewing deck where visitors have a visceral view into it, and also passes some of Kimberley’s most historic sites such as the Head Office of the De Beers Consolidated Mines Ltd and the original Big Hole mine dumps. THE GALLERY FOCUSES PRIMARILY ON COLLECTING SOUTH AFRICAN PIECES IN AN EFFORT TO UPHOLD THE HERITAGE OF SOUTH AFRICAN ART. Located in the Civic Centre gardens The William Humphreys Art Gallery has been around since 1952 and today focuses primarily on collecting South African pieces in an effort to uphold the heritage of South African art, past and present. The art collection here extends well past South African artists, however, with early pieces donated by Humphreys including 16th and 17th century Dutch and Flemish Old Masters, French and British paintings and antique furniture. THE TRANSPORT MUSEUM IS LOCATED AT THE KIMBERLEY RAILWAY STATION. The Transport Museum showcases the development of the railways and transport systems of the area. It also pays tribute to all involved in these impressive engineering feats, including the unsung heroes such as the black labourers who were not previously honoured for their toil on the railways. There is much to be seen here, including displays of a cabin of a real steam locomotive; the cycle used by the Southern Rhodesian Volunteers during the Anglo-Boer War and model trains from the Baxter collection. KIMBERLEY IS REGARDED AS THE CRADLE OF AVIATION IN SOUTH AFRICA AND IN 1913, SOUTH AFRICA’S FIRST FLYING SCHOOL OPENED HERE. Pilots of the South African Aviation Corps, later to become the South African Air Force, were trained in Kimberley. The museum can be found on the site of the original flying school and houses a life size replica of the Compton Paterson biplane as used for the training of pilots who included the nucleus of the future South African Air Force. The first female on the African continent to receive her pilot’s license, Ann Maria Bocciarelli, was trained at this facility. The Sol Plaatje House Museum hosts a library for African literature,with interesting displays on Sol Plaatje’s life. A founder member of the ANC, Plaatje would go on to become the party’s first secretary general. While based in Kimberley, the brilliant journalist, intellectual, teacher and linguist served as a court interpreter, translator, novelist and newspaper editor. He authored a number of important documentary books, in particular Native Life in South Africa and sang the first ever sound recording of Nkosi Sikelele’ iAfrika. The Sol Plaatje House Museum hosts a library for African literature, with interesting displays on Sol Plaatje’s life and the role of African involvement in the Anglo-Boer War. 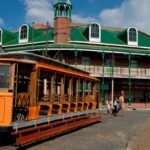 Recreating the energy and excitement of the historic diamond rush, the Flamingo Casino in Kimberley offers a variety of entertainment and leisure activities in a unique setting. Named for the abundance of flamingos that make their home in the nearby Kamfers Dam, the Flamingo Casino in Kimberley is a destination that is synonymous with fun. The Flamingo Casino offers a wide selection of slots and table games. Treat the family to a delicious meal at the Harvest Grill & Wine. Situated adjacent to the Kimberley Golf Club, you can tee-off on a challenging course. Offering a selection of superior conferencing and meeting venues, Flamingo Casino is the ideal choice to host your next function or event. Located in a historic diamond-rush town, there are plenty of family activities to enjoy nearby, like the popular Big Hole. The 11 000 hectare property is famous for its nocturnal animals including aardwolf, black-footed cat, Cape fox, caracal, aardvark and various species of nocturnal birds and rodents. Benfontein, which encompasses a large open pan, also supports herds of springbok, ostrich, red hartebeest, black wildebeest and gemsbok. The reserve is renowned for its pure population of black wildebeest. Leading research, worldwide, into the aardwolf is happening on Benfontein. Dronfield, a mere eight kilometers outside Kimberley, allows easy access to The Big Hole, McGregor Museum, Magersfontein, Sol Plaatje Museum, William Humphreys Art Gallery to name but a few. Your visit to the Northern Cape is not complete without a night or two spent at this magnificent property, Dronfield. Rooipoort Nature Reserve which dates back to 1893 was declared the fourth South African Natural Heritage Site in 1985. About 65km west of Kimberley, Rooipoort is situated on the transition zone between the Karoo, Kalahari and grassland zones. A visit to Rooipoort must include game drives accompanied by a guide as well as a visit to Bushman’s Fountain, one of the richest rock engraving sites in Southern Africa. Mokala National Park’s 28 414ha landscape varies between koppieveld (hills) and large open plains with the isolated dolerite hills giving the place a feeling of calm seclusion that contrasts with the large open sandy plains in the north and west of the Park. Drainage lines from the hills form little tributaries that run into main drainage line. Mokala is an important area for the regeneration of valuable species and is home to, amongst other species, Buffalo, Tsessebe, Roan Antelope, Sable Antelope, Giraffe, Gemsbok, Eland, Zebra, Red Hartebeest,Blue Wildebeest, Black Wildebeest, Kudu, Ostrich, Steenbok, Duiker and Springbok. Situated in the transition zone between the Nama-Karoo and Savanna biome, Mokala’s thornveld savanna, dolerite outcrops and riverine vegetation attract a prolific number of bird species, including: the black-chested prinia, blacksmith lapwing, melodious lark, cinnamon-breasted bunting, freckled nightjar, short-toed rock thrush, pygmy falcon and northern black korhaan. There is no fuel station or groceries shop in the park. The closest fuel station is at Modderrivier. As outdoor lighting in camps is limited, a torch/headlamp is required when walking outside at night.